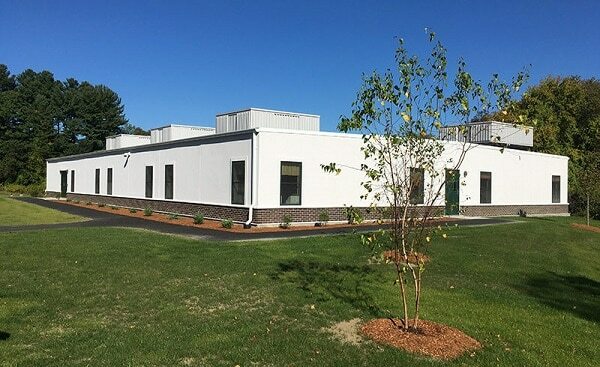 In 2017, one of Triumph’s most challenging projects was constructing classroom additions to all four elementary schools in Chelmsford, MA. As Chelmsford Public Schools wanted them up and running by September 2017, we built all four simultaneously. To achieve the ambitious deadline of September 2017, we started working on this project before summer vacation began. Three of the buildings have six classrooms plus restrooms; one building has just four classrooms. Although we worked against an extremely tight schedule, we installed buildings with concrete decks and full foundations. The interior fixtures and finishes are typical of a permanent building. As always, Triumph is committed to going above and beyond expectations. Due to the nature of the project, we worked around the clock, 7 days a week during summer 2017. Even though we only had one summer to finish all four buildings, we managed to get it done on time and under budget.